The book is about, among other things, the strongest boy in the world, a talking cockatoo, a faulty mind reader, a beautiful bearded lady and a nervous magician, an old museum, and a shrunken head. Blessed with extraordinary abilities, orphans Philippa, Sam, and Thomas have grown up happily in Dumfrey's Dime Museum of Freaks, Oddities, and Wonders. Philippa is a powerful mentalist, Sam is the world's strongest boy, and Thomas can squeeze himself into a space no bigger than a bread box. The children live happily with museum owner Mr. Dumfrey, alongside other misfits. But when a fourth child, Max, a knife thrower, joins the group, it sets off an unforgettable chain of events. In one of the last dime museums in the world, Dumfrey's Dime Museum of Freaks, Oddities and Wonders can now add the shrunken head of Chief Ticuna Piranha to the list of marvels, a treasure purchased from a dusty old antique store in the hope of bringing patrons back to the museum. But with the shrunken head supposedly comes a curse, made evident by an audience member found to have plunged to her death only hours after viewing the show. But she isn't the only one. In a string of strange accidents, murders and foul play, it'll be left up to orphans Pippa, Sam, Thomas and new resident Max to follow the clues to find not only the stolen shrunken head, but the killer who is determined to frame Mister Dumfrey. Everywhere the amateur detectives turn, reporter Bill Evans is on the case with his sensationalised headlines and campaign to slander the museum at every opportunity. As the body count starts mounting and the threat of being placed into foster care, Pippa, Sam, Thomas and Max will need to find the stolen shrunken head and the killer before he strikes again. I haven't always had the best author reader relationship with Lauren Oliver. I enjoyed her Delirium series, but both Before I Fall and Panic were books that I had so many issues with. Her new foray into middle grade with The Curiosity House series is a complete success and I enjoyed every moment. 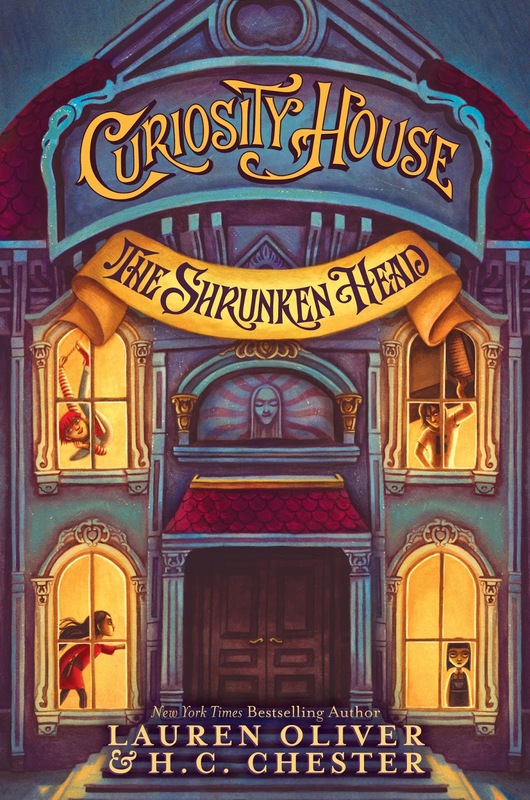 There is something so utterly lovely about a well written and adventurous middle grade series and installment one, The Shrunken Head, shows exactly why the young and young at heart are enamored by the genre. It follow the story of three orphans in twelve year old Sam, Pippa and Thomas who are about to be joined by new resident Max. The four children have extraordinary abilities and are among the headline acts at Dumfrey's Dime Museum, but business hasn't been as prosperous of late and without the shrunken head, they will be forced to close. The storyline although character driven, also features an old world charm to the New York location. Dime Museums were popular during the middle Nineteenth century as a form of entertainment for the working class. Most were little more than trickery in order to give patrons a cheap thrill, which also seems to be the case with Mister Dumfrey, with the exception of the four children of course. One of the main aspects that also draws me into reading middle grade are the illustrations. 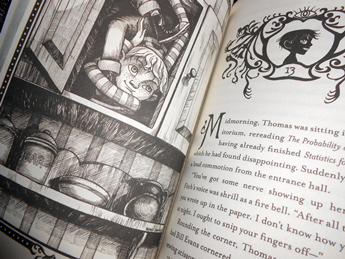 Whether it just be chapter pages or full page illustrations, it only adds to the magical reading experience and The Shrunken head was no different. The monochrome illustrations scattered throughout were absolutely lovely, I especially loved the imitation performer advertisement posters. So lovely and vintage. Even being a longer middle grade read, the storyline is not only wonderfully written but well paced. A mixture of old world charm, mystery and cheekiness that middle grade and early young adult readers will be enchanted by. The Shrunken Head is a brilliant first installment in what will no doubt be an incredible new middle grade adventure series. Mixing old world charm and a motley crew of weird and wonderful characters, it's wonderfully written and the mystery will thrill and delight readers with it's sense of fun and lighthearted humour. Perfect for older middle grade or primary school readers and early young adult readers alike. I can't wait to for the next installment in The Curiosity House series. Thoroughly enjoyed it. Kelly is currently reading Madame Tussaud's Apprentice and contemplating dying her hair bright red like a deranged rooster. I haven't read a book by this author before but she's very hyped in the community. I have to say though that none of her books have really appealed to me in the past. This though? I'm all for it even though I'm not a MG reader. The illustrations look so lovely and the creative story and characters sound very enjoyable. Thanks Nick. Her previous books have been a bit of a hit and miss for me too, but I adored this one. It's a little bit cheeky and such a lovely adventure mystery. I loved it and super excited to see where she takes the series. Woot woot this book sounds lovely! I am only recently wondering into childrens books and middle grade reads but this one sounds lovely. I am falling in love from afar with those illustrations! Plus, who can say no to a book with a bearded lady? Not I! And what a bearded lady she was Sarah. The illustrations are very vintage looking and really charming, it adds to the overall experience. I do hope you pick up a copy of this one, well worth the read. I can't imagine it's the same when reading an eBook version, the illustrations are just too lovely. I'm hoping to track down a hardcover edition soon and add it to my shelves. I love a well written and engaging middle grade read as well Lily, I'm thrilled that I was lucky enough to have been sent a copy or I might never have discovered this one on my own. I haven't read anything by Lauren Oliver yet. I know, it's crazy. But I do really want to read this one. I read a short excerpt for it earlier in the year and it sounded great, so I'm happy to hear you liked it so much. This is probably the perfect one to start with then Lauren. I loved it. It was really engaging and the main characters were all likable and well written, especially for a middle grade novel. I can't wait to see them grow up throughout the series. I rarely venture in Middle Grade, so I don’t think I’ll be picking it up. But illustrations are wonderful, looks like it’s one of those books, which need to be read in physical format. I used to be the same Ksenia, then I discovered Percy Jackson. Since then, I love a well written middle grade read, it makes such a nice change from young adult which is usually full of drama and tropes. Middle grade is just a wonderful adventure and reminds me why I love reading. Never say never. Maybe see if your local library has a copy and give it a try, it could really surprise you. One of these days, I will try Oliver's MG books...someday. Someday. This is the first one I've read Joy and had no idea at the time she had released others. I'll have to grab a copy too. I think she's a much better middle grade author actually. Even though I enjoyed her young adult series, it read very young. She's perfect for middle grade though. Adding to my Goodreads. I need this one in my life. You certainly do and I can't wait to see what you think of it. I hope you enjoy it as much as I have. Oh, this looks fuuuun. And great illustrations. Aren't they just! I love the vintage look for the era, it really gave it that old world charm and drew me in. They just add that little extra something to an already engaging and fun storyline. I love the illustrations in this novel, they look utterly divine! I'm the same as you with Lauren Oliver, some of her books have bit a hot and others a miss. Not sure if I'll read this one, but I'm glad you enjoyed it! I do enjoy a well written middle grade Jeann. I've been the same with her young adult titles too, some I haven't clicked with but I'm so glad I took the chance and read this one. Now I just need book two. Pronto. I started Miss Peregrine's a few weeks ago Jenna and just couldn't seem to get into it, but putting it aside to give it another go. I loved this one, I find these days that I seem to read just as much middle grade as I do young adult. I can't wait to see what you think of it. Sorry Aentee... But you really do need to purchase a copy. It's so darn cute and a wonderful read. The illustrations are so lovely scattered throughout and love the vintage look. Really adds another dimension to the storyline. I am glad that you adored this one too, Kelly!!! :) I read it a while ago and fell in love with the way this book was written. This was actually my first book by Oliver so at the moment, my relationship with books by her is pretty darn amazing. 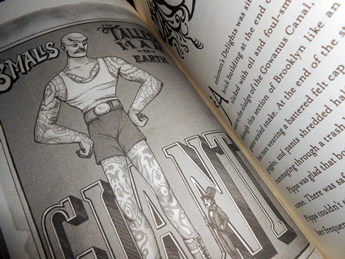 The illustrations in the book *are* gorgeous and add so much character to the story! AND THE CHARACTERS ARE ALL AMAZING, aren't they?!?! I love their awkwardness and how realistic they are in spite of the fact that they are "freaks." Thanks Rashika and I seen your review on Goodreads after I wrote mine and went to mark it off. I knew you would have loved this one too, I get most of my middle grade recommendations from you. The illustrations were amazing and the characters! I really fell in love with this one and can't wait until book two now. I was actually supposed to review this back in September but I haven't got around to it yet. I'm so glad they gave me an arc and hardcover of The Shrunken Head, because the illustrations look amazing in the finished copy! I adore Lauren Oliver's writing, (even though I haven't finished her Delirium series) so I'm really excited to see how her middle grade series turns out! I've been reading alot of MG actually! Me too Tika, it makes a refreshing change from young adult, they're generally fun and uncomplicated too. I really hope you get around to reading it, it's super cute and really spunky. The White Rose... I love this series!